Origin and distribution: The Boer goat is also known as Afrikaner, South African common goat and Boerbok goat. Boer goats evolved in South Africa from the indigenous African and the introduced European stock (Epstein 1971; Mason 1981; Campbell 1984). These include Bantu and Nubian, Saanen, Toggenburg and probably Angora. Out of South Africa, they are also found in Botswana, Lesotho, Swaziland, Zimbabwe, Namibia, Kenya, Burundi, Mozambique, Australia, USA, New Zealand, Germany, Israel, France and China (Malan 2000). Physical characteristics: They are typically white in colour with red head, blaze and pigmented skin, drooping ear, long leg and good conformation. Average wither height is reported to be 78 cm. Peculiarity: The Boer goats thrive in all climatic regions of South Africa including the Mediterranean climate, the tropical and sub-tropical bush, semi-desert regions of the Karoo and the great Kalahari. They are hardy, grazing on a wide variety of plants and in a variety of conditions, including Australian harsh inland areas where only very extensive grazing can be practised; they have low water turnover rates and low internal parasite infestation. They have an exceptional ability to withstand and resist diseases such as blue tongue, prussic acid poisoning and to a lesser extent, enterotoxaemia (pulpy kidney). The grazing habit of the Boer goat also makes it less susceptible to infection caused by internal parasites, as they prefer to graze above the ground (browse) (Malan 2000). On the other hand,Anaplasmosis ovis is the main factor, which has been associated with abortion in the Boer goats. Breed status: The Boer goat Breeders' Society was established in 1959, after which there followed selection guidelines and breed standards involving short legs, fleshiness, good thighs and hindquarters. The potential of Boer goats to produce cashmere hair has been recognized recently and is still being investigated (Couchman 1988). 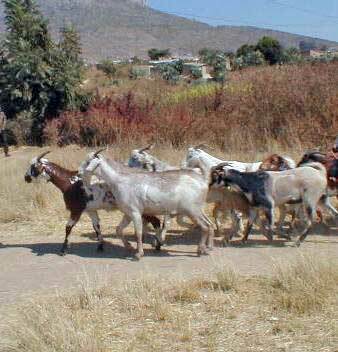 The estimated number of Boer goats is 2.12 million. According to J. Hendrik Hofmeyr, in DAD-IS 2004, the Boer goat population of South Africa in 2003 decreased. [CS 1.14 by Olivier]; [CS 1.26 by Ramsey et al.]. Utility: The main utility of Boer goats is meat. Growth rate of bucks is greater than that of a number of other breeds tested in Tunisia compared using weaning weight per doe per annum (van Niekerk et al. 1988). The birth weight is 3.2-4 kg. Average weaning weight is 24.9 kg (DAGRIS 2005). Male Boer goat in highly selected populations weigh 69-130 kg and females of this sort 51-80 kg, with the respective average growth rate of 250 and 186 grams per day. Grazing a variety of plants including bushes helps to control bush encroachments and re-growths, which is used in pasture management (Casey and van Niekerk 1988; Erasmus 2000). In addition, Boer goats offer a carcass that is generally lean with low cholesterol and this has resulted in the growing demand from the health conscious human populations in Europe and other developed countries. The dressing percentage is good, ranging from 40.3 at 10 kg live weight to 52.4% at 41 kg live weight; weights of replacement does at 12 and 18 month age are 40 and 50 kg respectively; Boer goats have a high muscle and low bone content with a ratio of 4.7 to 1. Individual variation for meat tenderness indicates the possibility for improving the trait through selection (van Niekerk 1988; Malan 2000) [CS 1.14 by Olivier]; [CS 1.26 by Ramsey et al.]. The breeding age is about 6 months. They are polyoestrus with a peak of sexual activity in the South African autumn and a low in spring and summer. The litter size range of 1.63 to 1.93 kids per parturition is above the average of many goat breeds, and selection for fecundity coupled with good management could raise this value to 2.25 or more (Greyling 2000; DAGRIS 2005). Boer goats are not good milkers because they are not selected for milk yield; however, they have a milk yielding ancestry and can lift their milk yield to about 3 kg per day. The present studies show that average milk yield is 1.5 to 2.5 kg, depending on lactation number and litter size with 4.3 and 7.7% protein and fat (Casey et al. 1988; van Niekerk et al. 1988). On the other hand, information in DAD-IS (2005) database provided by Hendrik Hofmeyr (2004) indicated that these goats have a lactation milk yield of 160 kg in 120 days of lactation with 5.7% butterfat. Casey N.H. and van Niekerk W.A. 1988. The Boer goat. I. Origin, adaptability, performance testing, reproduction and milk production. Small Ruminant Research. 1(3): 291-302. Campbell Q.P. 1984. The development of a meat-producing goat in South Africa. Proceedings of the 2nd Congress on Sheep and Beef Cattle Breeding, Republic of South Africa. Couchman R.C. 1988. Recognition of cashmere down on the South African Boer goat. Small Ruminant Research.1(2): 123-126. Epstein H. 1971. The origin of the domestic animals of Africa Volume I. Africana Publishing Corporation. New York. London. Munich. pp. 261-263. Erasmus J.A. 2000. Adaptation to various environments and resistance to disease of the improved Boer goat. Small Ruminant Research. 36(2): 179-187. Greyling, J.P.C., 2000. Reproduction traits in the Boer goat doe. Small Ruminant Research. 36(2): 171-177. Malan S.W. 2000. The improved Boer goat. Small Ruminant Research. 36(2): 165-170. Mason I.L. 1981. Breeds. In: C. Gall (Editor), Goat Production, Chapter 3. Academic Press, London, England,pp. 57-107.
van Niekerk W.A. and Casey N.H. 1988. The Boer goat. II. Growth, nutrient requirements, carcass and meat quality.Small Ruminant Research. 1: 355-368. Luo J. Sahlu T. Cameron, M. and Goetsch A.L. 2000. Growth of Spanish, Boer X Angora and Boer X Spanish goat kids fed milk replacer. Small Ruminant Research. 36(2): 189-194.